rocky's bru: After the separation, will NST be looking up? After the separation, will NST be looking up? Marina Mahathir sells papers, like it or not! Graphic courtesy The Star, with thanks to Helen Ang for the insight h e r e.
Not that long ago, the New Straits Times was the English-language newspaper in Malaysia. It was the flagship of the NSTP group. The best writers wrote for this 169-year paper and the best journalists wanted to be on its payroll. Many of the media industry's leaders today came from NST: Ho Kay Tat (the Edge), Jahabar Saddiq (The Malaysian Insider), Shamsul Akmar (The Malaysian Reserve): Nuraina Samad (The Mole); and Ashraf Abdullah (TV3), to name a few. NST is not what it used to be now. There are good journalists in there, still, and thank god for that, but the paper's been losing more and more readers. I fear that following the latest Mutual Separation Scheme, in which gems like Azmi Anshar ("one of the sharpest pens of our time ...") and Deputy Group Editor Rashid Yusof will pack their laptops and go, it will be a steep climb for the paper, if it manages to stop the slide in the first place. Well, the good news is I hear that Rashid Yusof is planning to start a news portal that will help restore our faith in professional and non-partisan journalism in the Malaysian cyberspace. Rashid, who has been a journalsit for close to 30 years, used to advise Daim Zainuddin and later Khairy Jamaluddin on media matters. I am one of those readers who no longer read the print version of NST, but I still buy the Sunday edition. Mostly because of the CBT pullout. I grew up on NST and have it to thank for my command of the language, such as it is. It was because the Star held no appeal to me then, it was riddled with so many language errors. I don't buy the printed paper mainly because I no longer have the time, but a part of the reason is I don't really care for propaganda disguised as news. Even as a BN supporter I am disgusted sometimes by the fawning over idiotic statements made by out of touch ministers. So I chose to no longer buy the NST, eventhough it still holds a nostalgic place in my heart. Everything that is related to Umno is at the end of its journey and there is nothing anyone can do about it. There are surviving at the expense of Umno, period and why is going to happen when Umno themselves are no longer around ? It is so pathetic to see such an end to a once mighty piece of print media. Now, why is that bad smell ? Lack of capable journalists or is it the editor's problems or is it "being paid" not to compete ? Use simple English, like most of the world's top posts do where everybody could learn and digest... he..he.. The Star is shining. Whats the trick ? Utusan supposed to be the all popular choice but 'some malay bastards' unnecessarily behaving "omputih celup" prefer those English news rather than to support their mother-tongue ! Chinese news like Sin Chew however still the choice among their ethnic. They truly support their voices now ! NST knows the answer why readers have abandoned NST. Why would I want to read a one sided boot licking arse sniffing newspaper which insults the intelligence of the readers. Me also. Tapi tak nyesal pun..
Rocky Hailing Professional and non partisan Journalism?! Friends say that the falls of readerships across all newspapers; are co-related to their level of PR bashing. Do you think that is accurate? bla bla bla... NST.. boring news. only government and toilet readers bought it. close it la. as usual chinese run papers are better than malays paidundertable papers. have to ask khazanah nasional to buy and sold to mat salleh. after all, the very least, we make some malay government servant richer. My 2 sen, NST no longer knows who are their target audience. Used to be a faithful reader but have switched to STAR as STAR has definitely improved its content quality. NST still doesn't have a decent business section. This is the end results of being pugnacious and most important of all not sticking to the one basic rule of journalism 'without fear and favour' ! Not so straight forward I think. Overall, the Star's editorial DNA is still pro-Government. Just like NST. Perhaps the Star does it "better" with columns that are critical of the government of the day, of Umno, etc. Things the editors sub-contract to outside contributors like Azmi Shahrom, Marina and the like. NST does not do that too well. It defends the government but it doesn't do it too well. "Intervention" from individuals in the government and in Umno does not help, either. But having said that, both the Star and NST are leading sites on the local cyberspace, according to Alexa rankings. Together with Malaysiakini and The Malaysian Insider. So many people may have stopped buying the NST and the Star but they still read the news online. I agree with Asri and Maae, finesse is important especially when you are seen as a government/Umno mouthpiece. 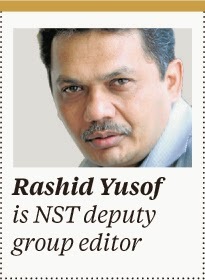 At the NST, the rot really started not too long ago, about the time they shrunk the broadsheet to a tabloid. The current editors are carrying the weight (thought some of the management chiefs are actually contributing to it). 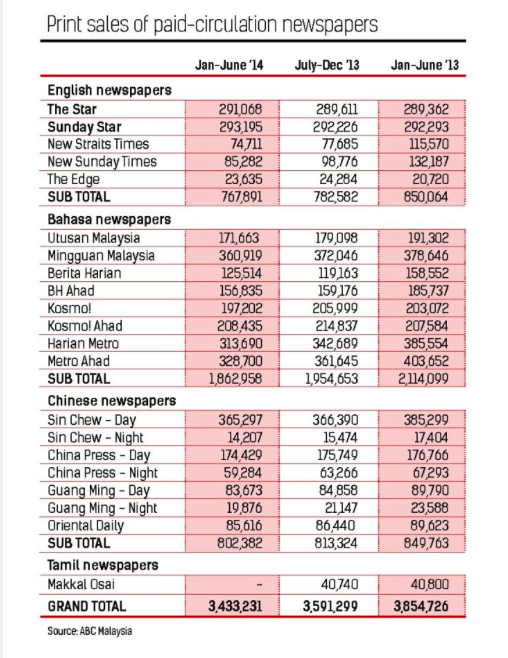 SPH's Singapore Straits Times, Business Times, Berita Harian and Tamil Murasu all are doing well as full size "broadsheet" newspapers. In Malaysia, the "broadsheet" newspapers have been downsized into tabloids. It is the quality and credibility of a newspaper's journalists, reporters and editors that count. Can you honestly say that the staff of the NST meet this criteria? "...a news portal that will help restore our faith in professional and non-partisan journalism in the Malaysian cyberspace." Latuk, if they paid you even more than they already do, I bet you could pull that off. Pemandu or Bersih's Walk Against Corruption? Bar Council's election "tak bersih"!? What's wrong with Apanama lah?